Staff: The history of the OB Rag will be the subject of a presentation at the next OB Historical Society’s monthly gig. That will be Thursday, June 16th at the P.L. United Methodist Church, 1984 Sunset Cliffs Blvd, 92107. The presentation will be by current OB Rag Editor Frank Gormlie. 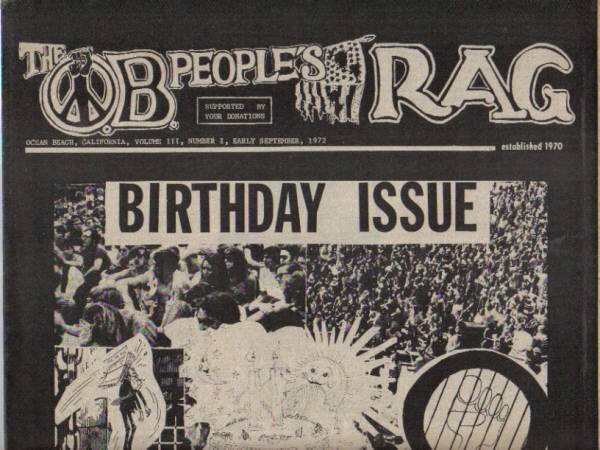 In light of that, we thought it would be cool and appropriate to publish some more history of the original OB Rag, OB’s underground newspaper of the 1970s. The following recounts the 2nd anniversary of the first OB Rag. By Fall of 1972, it was the OB Rag’s second birthday – the beginning of its third year, and the community-wide effort to develop alternative institutions was in full swing. The OB Community School was a year old. A childcare center had arisen among needy parents who were assisted by activists. The OB People’s Food Store had opened in a storefront. And finally a new grassroots urban planning organization was in the process of forming, which eventually paved the way for a community frontal attack on the developer-driven Precise Plan. Again, the Rag was on the front lines promoting all of these alternatives, as many of the paper’s staff were involved in these efforts.By now, the paper had taken on more a “professional” look; it was printed on newsprint with 16 pages – for a while it even had justified columns – but usually the text was simply typed out on typewriters. It had more photos and local news, along with poetry and artwork by local residents. For example, the “birthday issue” contained a half page of local news, two-thirds page of national & international news, a half page of “the people answer” – a periodic poll by Rag staffers with photos and direct quotes of those polled; a page of local poetry, called “the Poet’s Circle”; a back page devoted to a detailed daily calendar – called “Goodvibes” and a “community bulletin board” of classifieds. Articles included one by Kathy Doyle on her recent ‘natural child-birth’, a “open letter to the male residents of OB” about rampant male chauvinistic behavior in the community; several pages devoted to a Rag staffer’s personal account of the 1972 Republican Convention protests in Miami; an interview with a local progressive concert producer; and finally a fictional piece about the disappearance of the OB Pier. Significantly, this issue also contained two pages worth of advertisements – a clear indication that the paper was being sustained by the businesses that catered to the hip and young. The paper was also sustained by donations — cans were set up adjacent to stacks of issues in 18 stores within the beach area. The Rag was publishing 5000 to 10,000 copies twice monthly (or at least that was the goal) and was being distributed throughout OB, in markets and stores — at one point, it was in 18 local businesses – and informally on a couple of college campuses, and in a few stores in Mission and Pacific Beach. Importantly, the Rag had established itself as a regular periodical, and its pages contained many ads from local businesses – as mentioned – but this was very significant as it meant that the “hip-eoise”, the hip small to medium businesses, supported the paper and perceived the paper as reaching its potential clientele. As part of the Rag’s philosophy, issues were mailed to jail and prison inmates free of charge. In addition, the paper was tied into a couple of news services, including LNS -Liberation News Service – an information distribution system outside mainstream media that regularly sent the Rag news, photos, and graphics pertaining to national and international issues as viewed from a progressive perspective. Decision-making on the Rag’s staff was usually by consensus, as the core folks worked together as a collective. At staff meetings, still held at someone’s house, while they consumed gallons of coffee, the collective discussed future articles and other material, tasks divided-up, and then usually everyone would hand address copies going out to the growing subscriber list. After the articles and graphics were completed, it would usually all come together in one long all-nighter, with the entire production staff joining in to do the final editing, typing, and cutting and pasting. As the Rag evolved, it went from the use of student newspaper lay-out facilities at UCSD to owning its own light tables and having its own office – major evolutionary stages. These were the days of old school lay-out production, pre-computer and desktop publishing, where sharp x-acto knifes and messy glue were the tools by which publications were crafted. Once finally laid-out, “put to bed” as it was called, the production staff would collapse from exhaustion, and the designated drivers – the ones who drove the copy to the printer – would take over. At one point, newsprint became so expensive, staffers were forced to drive up to Riverside to have the publication printed – what with the paper’s shoe-string budget. As soon as the paper was published, staff members and a few trusted friends would grab stacks and stand at busy Newport Avenue corners and in front of OB’s then two major markets, Safeway and Mayfair, selling copies. The Rag was becoming popular and was being supported by the community with donations, subscriptions, and written contributions. The sun is rising again as O.B. Community School begins our second year of alternative community education. We are not the ordinary school. We are a place where learning takes place. Learning how to live in harmony with life. Not how to control or be controlled. That is our theory, that is our structure, that is our life. We are an alternative to the public school. Our students are not students, our teachers are not teachers. We are all friends and we depend on that relationship for all our mutual learning. We talk with each other about our desires, our problems and our adventures. We learn about ourselves and life by being together and sharing. We do things. We garden, we build structures, we travel, we become a part of our community. You have probably seen us before.. We have been to city council sessions, to the libraties and bookstores, we have picnics at the ocean and the parks. We get involved in our community and learn first hand. We are a small school – and more important we are a happy school. We like to make new friends. Soon we will be starting a new school year. If you are interested in becoming a part of a significant, for real learning situation, come over and talk with us. OB Free School & Ecology Action take to the streets in anti-high rise demonstration, fall 1972. The original food co-op had emphasized 5 basic principles, which were: (1) break down the alienation that exists in our community; (2) Do away with hierarchy; (3) Operate on non-profit basis; (4) Give the small farmer and gardeners a chance to sell their produce; (5) Try to offer organically grown food at the lowest prices possible. Soon the OB Store, if every thing goes well, will be able to drop down to 15% or even 10% mark up. The store wants to charge just enough to support three or four full time people, who get just enough to eat and a place to live. The store’s basic aim is to get away from the corporate stores and agribusiness; at the same time supporting small farmers and OB people who want to sell their garden crops through the store. The store collective also will be making homemade granola and yogurt. Back in the early 1970s, the ecology movement was very young. The first Earth Day was held in June 1970. Just eight years earlier in 1962, biologist Rachel Carson had published her “Silent Spring” in which she described a possible environmental scenario that due to the collapse of the songbird populations from DDT and other poisons, the spring was “silent.” This first inkling of environmental consciousness in this country began the transformation of how we think about and act within our ecology. One of the ways this new ecologically-minded thinking took hold in Southern California was in a high-tide of pressure for public access to the Pacific Ocean. There were plenty of areas where there were wall-to-wall expensive homes that literally sealed off from the public direct access to the coves, cliffs, rocks, sand and water of the coastline. Clamor for this increased public access to the coast developed in San Diego as well., resulting in the passage of the 30 Foot Height Limit in 1972. Led by a genuine grass-roots movement to place it on the ballot, the height limitation was voted into policy for the City. This tremendous victory for quality of life politics meant that for a certain yardage from any coastline or waterway, no buildings could be built above 30 feet – or roughly three stories. This was very significant for future development at the coast and in Ocean Beach. Yet for most of 1972, there was no 30 foot height limit, and there was no OB Planning Board, there weren’t too many controls or restrictions on development, and there weren’t the widely held beliefs that most hold today about saving the environment, preserving openspace, recycling, about global warming. However, Ocean Beach was in front of most communities in terms of the ecology. There had been OB Ecology Action Committee, begun in 1970, that had been instrumental in halting the jetty project; there was the on-going movement to save Collier Park; there was a general dislike for higher density, traffic, etc., and by the point in the early seventies, there was a resistance growing to the urban plan for Ocean Beach, the Precise Plan, which was promulgated by a financial elite association. One of the first organizational manifestations of OB’s resistance to the Precise Plan, was the formation of the OB Planning Organization (OBPO). The main contribution that this group provided to the community was to conduct a door-to-door poll of OB residents to garner their opinions about a variety of development-related issues. The following statistics were taken from the survey that was conducted by the Ocean Beach Planning Organization (OBPO). Results were released this past April 1972. 8,500 households in Ocean Beach were hand-delivered the surveys and 2,805 of those surveys were returned, i.e., a return of 33%, an outstanding return by any statisticians analysis. The percentages given below are from those surveys that were returned. 87.3% favor a moratorium on all new building construction in Ocean Beach until a comprehensive plan is approved by a majority of the residents. Flushed with such substantial support among OB residents for the anti-development positions of grassroots activists, as clearly evidenced by the survey’s results, there was a surge in educational and organizing efforts by OBPO, Ecology Action and the Rag. In October 1972, the Rag – in conjunction with the ecology group – published a special issue, slim but on special paper, which was more of a broadside against four particular apartment developments either then under construction or soon to be. It was a call to arms for the community to come to terms with the rate and scope of apartment development. It decried the evictions of those whose homes were being replaced by apartments. On the front cover was a mock “special invitation to land speculators and developers” to come to OB and make big money by investing in high density development, and “just buy the land, evict the present occupants, (mostly working people, retired elderly, and ‘hippies’), sell their outdated houses to the Mexicans, then build on up to your heart’s content.” The Special Issue was hand-delivered to every house from the beach to Ebers Street. Inside the special October ‘72 issue was a loose poster-sized sheet, blank on one side. The other side had the large OB initials popularized by the Rag, with the peace sign inside and fist gripping the top of the”O” , in green. It was the “Green OB” – made famous over time by residents and activists. The special issue proclaimed: “Help keep OB Green – Display the Green OB”. … the green OB was to have been a “people-helping people” trip. A person who was getting hassled bay the Police could come to a nearby Green OB house and get a witness and support, a woman who was getting hassled by some man could seek refuge in a Green OB house. If your dog had just been run over, if your child had just banged up her knee, help could be found in a home displaying the Green OB; hopefully most houses. Unfortunately, the project never received the necessary energy and was put aside. But the Rag announced “a rebirth” of the Green OB, as so many had been distributed in the Special Rag issue, that dozens of the posters were been displayed in windows across OB. It was now being a symbol of “community support and togetherness, and unity against the developers.” The Green OB had be come a symbol of OB’s solidarity against development. A windshield survey was once conducted by Charlie Marshall and Frank Gormlie, and they counted about 80 posters being visibly displayed, mainly in windows on residences and apartments throughout OB. OB Rag collage of “Green OB’s” in windows of various houses and apartments. Postscript: The Green OB has lived on. It is embodied in the masthead of the blog you are currently reading. It was also adopted by OBGO (Ocean Beach Grassroots Organization) during its run of the early years of the new millennium. 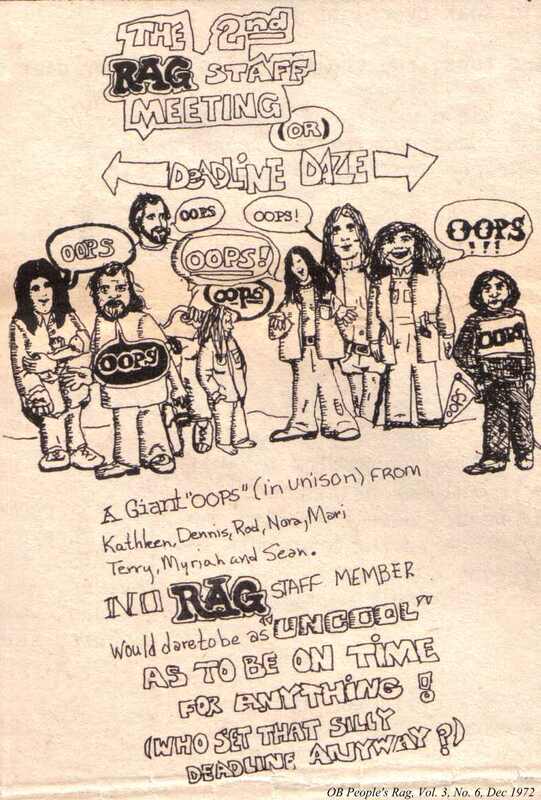 From the OB Rag underground newspaper of the 1970s back to the OB Rag blog of today. there’s a lot of history here to digest. sorry if we digress and not comment immediately. lots to thimg about. Ditto bodysurferbob – commenting prematurely before reading – but happy second 2nd birthday! Or is it the third 2nd – did the early 2000s print version go two years? The prime movers for the OB community free school were Dennis, Kathleen, and Tom. I went on a trip throughout Mexico that summer with Tom and joined immediately at school start, leaving primarily Dennis, Kathy, Tom and I as running the school. David Diehl joined later as did Barb. Others came and went through the next few years. For the store, Willie was the prime mover on that. Diane has a job, but contributed a lot and I became the primary helper for Willie. The three of us opened the store and were the main ones operating the store for many months. I remember we made less than $20 a day for the first week, but broke $20 on the weekend, which meant we could keep the store open as it made our rent. Kathy painted the large sign with the tree and the free school students often helped out. Perhaps 6 months into operation, maybe more, our first “manager” was Deborah, a student from our school, who was such a dedicated helper. Anybody remember Charlie Browns Restaurant on the corner of Bacon Street and West Point Loma Blvd? I worked there from maybe 1969 to 1972 and lived in the little store front 50 yards south on Bacon St. We all moved out to Golden Heights for a while till it all folded. Looks like the Corner Bar now. I believe Clark and Charlie Brown have passed on by now. We LOVED the hamburgers at Charlie Browns! When Thee Bungalow took over, we went there and were astounded and outraged to find no hamburgers on the menu. It was the start of OB gentrification. 1972. Charlie Browns was great. If I remember right, they served their hamburgers on sourdough bread instead of a bun. My whole family loved them and we were disappointed when they closed. Search Clark W. Brott and you will find a nice eulogy for Clark mentioning Charlie Brown’s Good Earth in OB. Clark was the other half of Charlie Brown himself and lead guru for the family that centered around the restaurant. Clark and even I did some cooking while Charlie liked the bar. If you ever had a Garden of Eden Omelette it was my creation. Ema “Davey” Davis was his anthropology associate and financier of the Golden Heights dwelling. I still have a beautifully crafted obsidian crescent blade recovered from the Panamint archeology digs. RIP. Older Article: Happy Birthday OB Rag! Today is our 2nd anniversary!